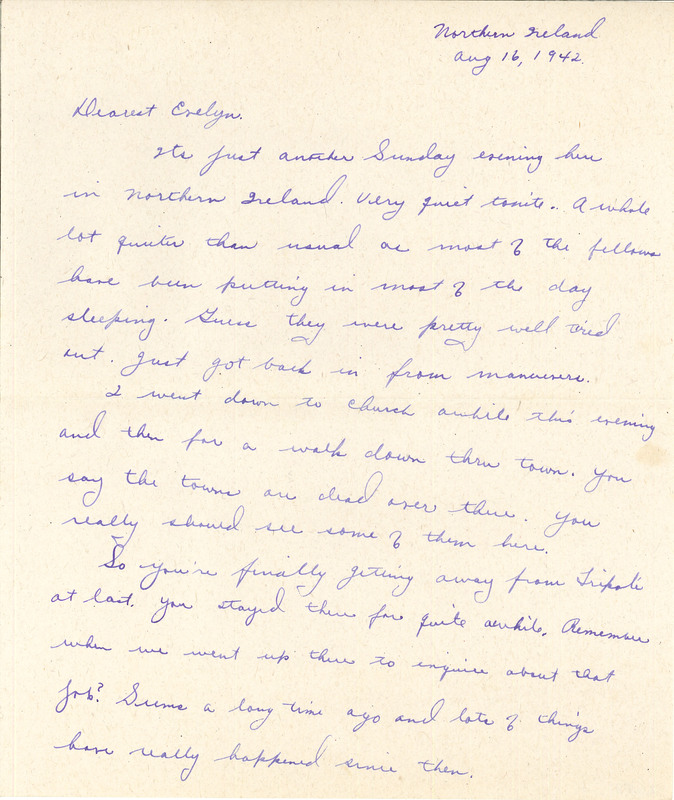 Northern Ireland Aug 16, 1942 Dearest Evelyn. Its just another Sunday evening here in Northern Ireland. Very quiet tonite. A whole lot quiter than usual as most of the fellows have been putting in most of the day sleeping. Guess they were pretty well tired out. Just got back in from manuevers. I went down to church awhile this evening and then for a walk down thru town. You say the towns are dead over there. You really should see some of them here. So you're finally getting away from Tripoli at last. You stayed there for quite awhile. Remember when we went up there to inquire about that job? Seems a long time ago and lots of things have really happened since then.